More fighting for the defense of Crete. Regular setup of defending British\Empire troops verses German Paras and some regulars. This time a bridge assault with the Germans coming from both directions to try and dislodge the Brits in the Gorge so that they could link up. 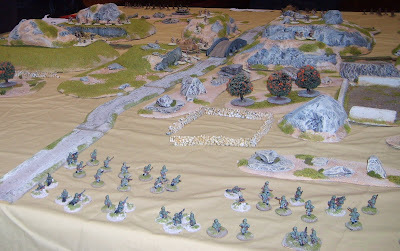 20mm figures and terrain supplied by Matt. Rules are 40K based but with limited weapon range and ammo. And for a change there was armour involved as 2 Panzer mk.III's try and take on a Matilda, a Light Tank, and some AT weapons. As can be seen the centre section of the battle field was terrain heavy. As I was in charge of the paras, trying to link up with the main force, I decided to place all my troops on one side of my deployment zone away from the open terrain. They hugged the terrain like mad when advancing with only my snipers and MGs popping up to shoot, and my observers sending in some mortar fire. Only really had one effective mortar (the sole medium) and spent most of the time trying to move my remaining light mortars forward. A long range duel broke out between an MG34 and a Bofors gun. The Bofors eventually won but with it's crew badly depleted and was then taken out by fire from a couple of Anti-Tank Rifles. 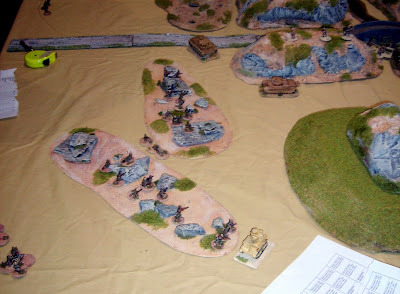 The tank battle was a bit of a stand off as they traded shells at close range but with little penetration. The allied anti-tank gun never got a chance to fire as the panzer's refused to come directly down the road. One Panzer got a bit shaken for a while but no vehicles were put out of operation on either side. Eventually the paras and regulars were able to wave at each other across from the high ground to the rear of the farm house, in which my sniper and observers were hidding, with a good view of the bridge. The game ended at this point as the allies agreed to withdraw due to their low ammo situation. The Matilda was almost out of ammo, two rounds left, and with the German Infantry closing into charge range holding the bridge looked pretty unlikely.